Wait, isn’t that a title in it’s own way? Isn’t it? No? Whatever, man. Here’s what I’ve been doing since my last post. 1.) I’m working on a book cover for a friend of mine. Part of my Christmas vacation unpaid days off will go towards working on this because it’s such a fun picture. I’ll just say that it’s slightly video game related and leave it at that. The story of how I got the gig will have to wait until later. You pick two characters and the game screen they appear on. Then you choose the portrait that appears behind the character (if they even have a portrait) and the logo. 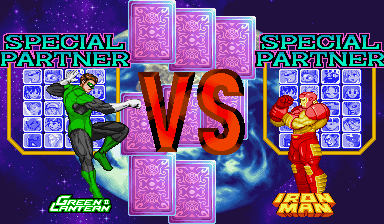 I had to resize and remake the logos that didn’t come from the Marvel Super Heroes or Marvel vs. Capcom games. You can’t just resize them because they’ll usually just look like crap. After I’m done with the book cover, I’ll be back to work on a more versatile version of this that does more than just Vs. Screens. I may be on to something with this. 3.) Being angry that I haven’t had enough free time to play Fire Pro Wrestling Returns after waiting an eternity to buy it. Yeah, some of my Christmas free time will go towards that, too.